Built with a lightweight ALUXX aluminum frame that’s designed for smooth-rolling 700c wheels Escape City Disc is a fun efficient bike that’s versatile enough for city commutes or longer rides to build up your fitness. Stable geometry and a wide range of gears make it easier to tackle hilly terrain even when your racks and cargo bags are loaded. And it’s designed with neutral upright positioning which helps you navigate city streets or crowded bike paths. Outfitted with fenders and a rear rack you can easily carry your work essentials or head out for a weekend adventure. Choose the disc-brake model for powerful braking in all types of weather or a standard brake model. 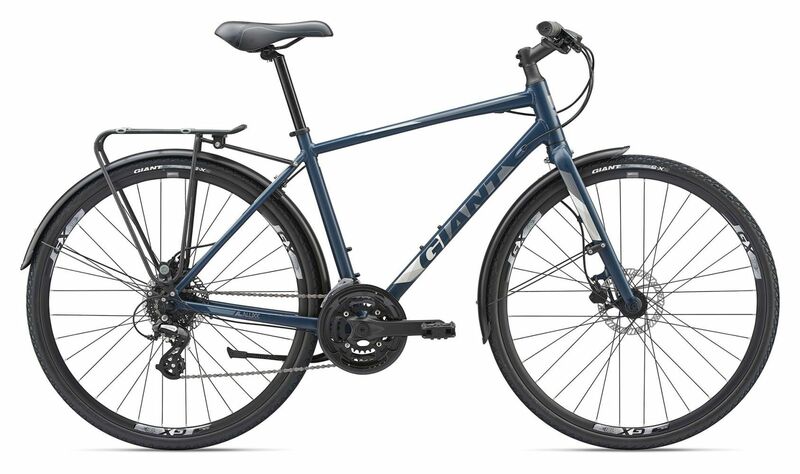 Please see below for delivery options for Giant Escape 2 City Disc Sports Hybrid Bike 2019.